Where I got it: I purchased this for review. Soledad, incredibly talented dancer and recent high school graduate, knows exactly what she wants for her future. The summer after graduation, she plans on teaching at a ballet studio and, come January, will move to NYC to make her dream of dancing professionally a reality. But then an incredible opportunity presents itself: to play Carmen, the passionate gypsy of opera fame, in a drum and bugle corps for the entire summer on a tour of the country. Plus, she'll be spending time with the intoxicating and beautiful Jonathan, her classmate, a corps member, and the one who presented her with the idea in the first place. Soledad's world is opened by her experiences in the strict corps, and her dancing is all the better for it. But her story doesn't just include a performance as Carmen; it mirrors it. It's clear after a few encounters that another is after her affection, and the results may spell ruin for Soledad and for her future. For Valentine's Day, I wanted to pick a book that dealt with love, but also with passion. 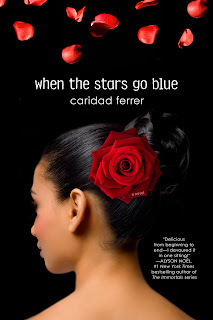 I figured a book based on the story of Carmen was a perfect fit, and I was right. Soledad and Jonathan's romance is fast and furious—the attraction is instantaneous, when Soledad notices Jonathan for the first time. Despite his crush on her for the four years they've been in high school together, he has never gotten the nerve to talk to her before his idea to have her audition as Carmen, and it's immediately clear that his passion has been burning for a long time, all but exploding when Soledad begins to return the affection. What I love about this book is how real all of the relationship felt to me. In high school, things do happen that fast. "I love yous" are exchanged, and you'll spend as much time as possible together. The interactions are believable, especially Jonathan's jealousy and slight possessiveness. This being their first real relationship, both Soledad and Jonathan are feeling it out and learning what it means to be in a relationship, though not always in a positive way. Soledad narrates, and her language is spot on. It has just the right amount of cursing, and rarely did I think Ferrer tried too hard with making her sound like a teen. She did a fantastic job with that. My only complaints are the overuse of elipses throughout the text—some places it worked, but I got annoyed with them more often than not—and the chapter titles, which seemed to be all song titles. Again, some worked, but for some I was confused about the link between the title and content. And let's talk about the corps for a minute. I loved reading about the marching and the performances; I was in marching band in high school and didn't particularly like it, but I had a pride in being a part of it. It's nothing compared to what this corps was like though. The intensity and precision, the descriptions of everything, are fantastic. And Soledad's description of her dancing is thrilling to read. This is a great story about first love and incredible passion, yet also shows which behaviors can be harmful. Plus, a modernization of Carmen? Awesome. Ferrer does a lovely job at bringing the emotion and power of the opera into a modern teen context. I couldn't have asked for a better Valentine's Day read. Very nice review. This is not a book I would pick up, but I liked reading about it. This book looks great! Gorgeous cover. I'll have to keep an eye out for it - thanks for the review! It really is pretty fantastic. I liked it more than I thought I would. I especially liked how she handled the ending. Well, it's a beautiful cover to say the least. Love your review. Thank you! Yeah, I really love the cover. It was the thing that convinced me to actually buy it. Great review! I read this one a while ago, and absolutely loved it!